Nigeria coach Stephen Keshi has been urged not to try to stay in the job after failing to qualify the team for the 2015 Africa Cup of Nations. 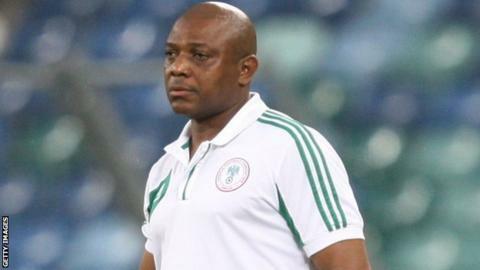 Keshi is currently without a contract with the Nigeria Football Federation. And a top NFF official told BBC Sport: "Walking away honourably would be the smartest thing for Stephen Keshi. "It's pointless to hang around when you've failed, have been completely rejected by the NFF and are unwanted by disappointed football fans." Keshi endured a turbulent time during the qualification campaign, in which he was sacked by the NFF and only reinstalled after intervention from Nigeria President Goodluck Jonathan. And the intensity of speculation about his future increased following Nigeria's 2-2 draw with South Africa in Uyo last week that meant they will not play at next year's continental finals in Equatorial Guinea. Nigeria had gone into the that match knowing a win would earned their place at the tournament, their failure to do so has left NFF president Amaju Pinnick refusing to name who he believes is "the ideal man to lead the team from the present dark to sunshine". Keshi himself has refused to comment on whether it is the end of his time as coach with the team he steered to Nations Cup glory in 2013 and led to the last-16 of this summer's World Cup in Brazil. But the NFF official added: "He does not have any contractual obligations with the federation; remember the board also offered to sponsor him and his assistants to managerial courses with good intention. "He will probably get a job elsewhere before January but the country will not get the opportunity to play at the next Nations Cup."